Sean Rafferty with a lively mix of chat, arts news and live performance. Sean's guests include the Sitkovetsky Trio, Kirill Gerstein, Guy Johnston and Tom Poster. Sean Rafferty with a lively mix of chat, arts news and live performance. 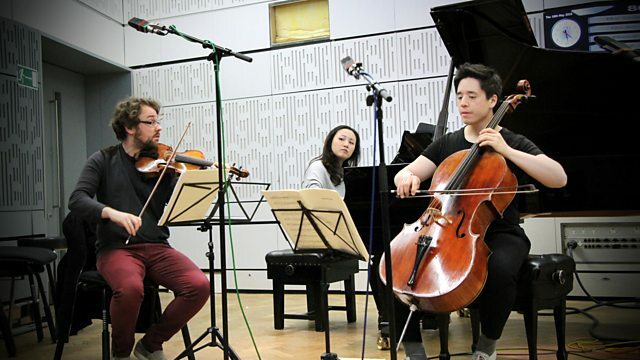 Sean's guests include the Sitkovetsky Piano Trio, performing music by Beethoven and Dvorak. Pianist Kirill Gerstein talks to us down the line from Glasgow ahead of concerts with the Royal Scottish National Orchestra. Guy Johnston and Tom Poster perform together before they perform at Highclere Castle as part of Newbury Festival. Orchestra: National Philharmonic Orchestra. Conductor: Richard Bonynge. Performer: Michael Collins. Orchestra: Swedish Chamber Orchestra. Crusell: The Three Clarinet Concertos. Singer: Nigel Robson. Choir: Monteverdi Choir. Ensemble: His Majestys Sagbutts and Cornetts. Ensemble: English Baroque Soloists. Conductor: Sir John Eliot Gardiner. Singer: Jessye Norman. Orchestra: Gewandhausorchester Leipzig. Conductor: Kurt Masur. Strauss, R.: Four Last Songs; 6 Orchestral Songs - Norman, Gewandhausorchester L.
Orchestra: Granada City Orchestra. Conductor: Josep Pons.